Home→Pet Health→Microchips for Dogs & Cats: Why should you microchip your pet? Microchips for Dogs & Cats: Why should you microchip your pet? Why do we love our pets? It could be because their love and loyalty is so unconditional. Whether we have had a good day or bad, they are always there offering support. In return, they trust in us to provide for them. Obviously, pets need to be fed, exercised and directed. They also need to be identified should they become separated from you. An open door, a hole under a fence, a simple distraction is all it can take for your pet to wander. As many as 80% of unidentifiable pets are never reunited with their owners should they get lost. Throughout the month of September, the American Kennel Club celebrates AKC Responsible Dog Owners. Responsible dog ownership includes micro chipping your pet and keeping up to date on registration information. Below is a description of how the pet microchip process works. A pet microchip is the most permanent form of pet identification available today. About the size of a grain of rice, it is inserted painlessly by your veterinarian between your pet’s shoulder blades. There are several different types of microchips on the market in the United States. The 15 digit ISO pet microchip is the world standard. Many countries require this type of pet microchip for entry. Even if you don’t plan to travel with your pet, animal control agencies in cities and towns all over the United States have microchip scanners that can read an ISO microchip, and that is the first thing they will do when capturing a lost pet. After micro chipping your pet, the next step is registration. All manufacturers have their own database with owner contact information associated with every microchip number. Some manufacturers charge pet owners for registering, but some don’t. 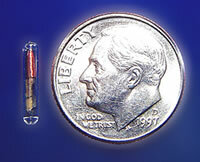 Datamars is a manufacturer of the ISO pet microchip. Their database can be accessed at PetLink.net and provide pet owners with free registration and unlimited changes to their contact information. The concept of pet identification is quite simple but often misunderstood. It is the pet owner’s responsibility to be sure that their pet can be identified if they get lost. You must stay current on microchip registration information. If you plan to more or switch phone numbers, update your pet’s registration information. • Always keep a picture of your pet handy (better yet, one of you and your pet) in the case that identification is necessary. Pet identification is a simple thing. Ask your veterinarian about inserting a pet microchip. Additionally, don’t forget to register! If you microchip your pet, it could mean the difference between finding your pet or not.